1. Remove a leaf from the plant below the main flowering element. Make sure the leaf comes away clean and contains all parts of the leaf. 2. Put leaf in dry area and allow to dry. This process generally takes a few days. 3. When leaf becomes calloused, it is time to plant. When calloused, the leaf will appear splotchy, discolored, or brittle. 4. Place well-draining or succulent soil in a drainable pot. 5. Set leaf on top of soil. 6. Leave for several weeks. 7. 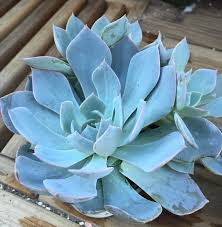 Water your succulent very little, about once a week. Be careful to avoid overwatering. 8. When roots appear, remove the parent leaf. Typically, this leaf will wither. Be careful not to damage the new roots in this process. 9. Your plant will take root and you will have a new succulent. 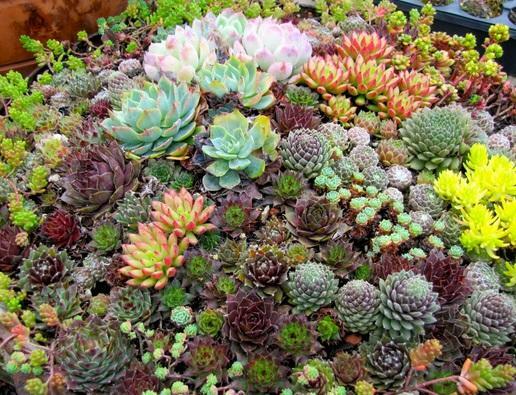 Bring your succulents indoors for the winter: Many of these exotic plants do not fare well in the winter. If you live in an area that has a cold winter, you can easily transplant into a container for indoor storage. 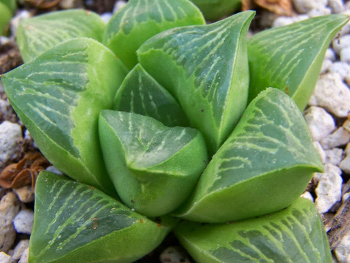 I'm a gorgeous succulent whose leaves vary from yellow to green. I'll produce many offsets and bloom white flowers in the summer. 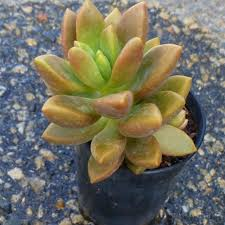 Unlike other succulents, I enjoy shadier, slightly cooler locations (65-75° F) and will do best in regular potting soil vs. cactus soil. Water me whenever my soil is dry from winter to spring, and in the summer months water me less frequently and keep me away from hot, bright sunlight. 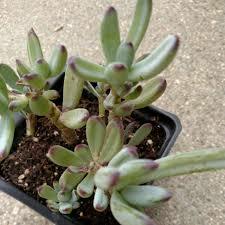 I'm a pendant sedum with beautiful leaves that can vary from gray-green to blue-green in color. A couple weeks after I arrive, I need light, even watering regularly to keep slightly moist. After that, I only need water every 10-14 days. If any of my little leaves fall, they can be used to make more of me! Partially nestle any fallen leaves in a soilless medium like sand or perlite and spritz with water daily to propagate. Did I arrive with one of my stems beheaded? Lucky you! In just a few weeks, I'll grow two or more rosette heads in its place! 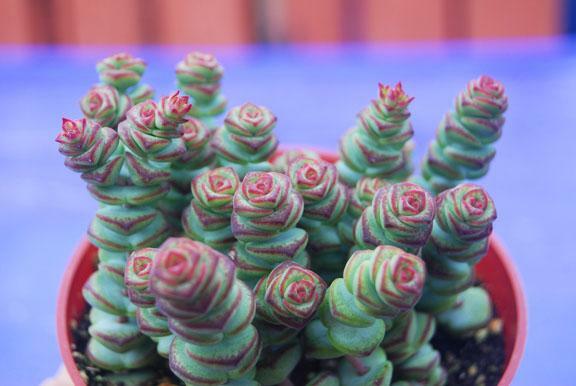 I'm a fun little Crassula with thick green leaves lined in pink, and I'm easy to grow! I do great indoors in the winter, just water me once every 3 weeks. In the summer I'll need a good soak once a week. 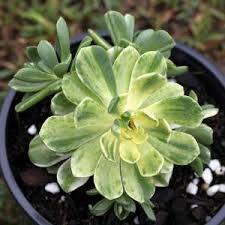 I have gorgeus leaves that vary in color from a muted powdery blue to pale lavander. 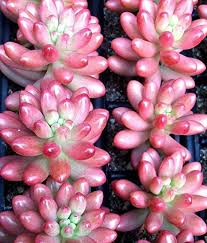 My leaves grow together in compact bunches, and once a year, I will grow a long stem with pretty pink-red flowers on it. 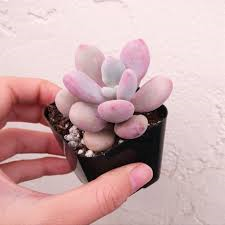 I am a sibiling of the Powder Puff succulent, and my care is similar: I crave dry soil and intense sunlight. 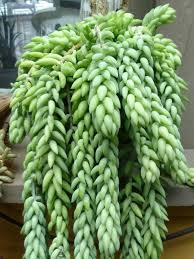 I'm a close relative of the Ripple Jade, and like my cousin, I cannot tolerate over-watering. When repotting me, make sure to gently crumble away old soil from my roots before putting me in fresh, dry cactus soil and do not water me for a week or so. This will help keep me healthy. 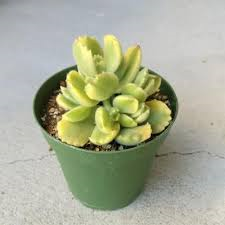 No matter which name you call me, I'm a very low-maintenance succulent that will grow adorable, bell-shaped golden flowers. I grow slowly, so please be patient with me! I like medium to full light and very little water. I'm less spooky than I look! 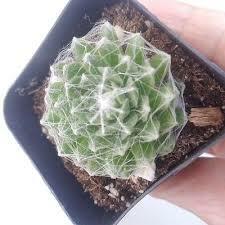 I am a low-growing plant with fine, cobweb-like hairs at the tips of my leaves. I will grow pink flowers once a year. During the winter months, I don't need much water at all. During the summer, I need more regular watering (just make sure my soil is dry in between waterings). I come in many different tones of copper and yellow, and gardeners joke that I'm easier to care for than a stone - hence my name! I'm the ideal plant for those areas in your home or garden that get intense sunlight. I will bloom beautiful little flowers that are white, star-shaped, and fragrant. I'm a bushy cactus with long, segmented stalks that can grow up to two feet tall! I will flower beautiful yellow flowers at the tops of my stalks. I need about a month’s rest after I flower, so water sparingly during this period. Also - try not to move me after I flower or my fragile flowers might fall off! 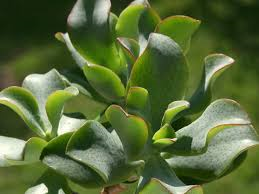 I'm a slow-growing, shrubby succulent with beautiful waxy leaves and thick stems. My leaves start green when I'm young and will eventually turn a gorgeous red-orange as I grow in bright sunlight. Along with bright sun, I like regular watering from spring to autumn (as always, let my soil dry out between watering), but during the winter I only need enough water to keep my leaves from shriveling. 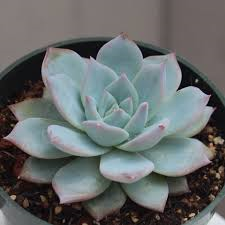 I'm a hardy succulent with thick, pointed leaves that vary in color from a light, pastel purple to pale blue. 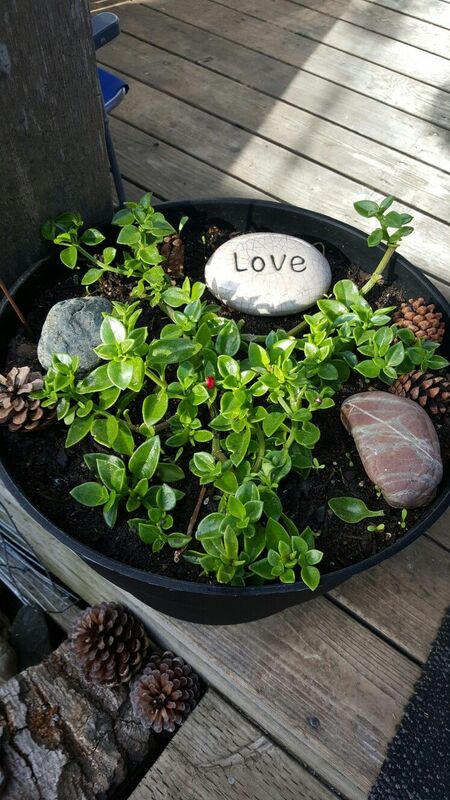 My pot needs to have a well-draining soil and drainage holes, and I'll also do great with a mixture of soil, sand, and rock. I love a good soak when watered, but these soaks should be infrequent (10-14 days) and only when my soil is dry. 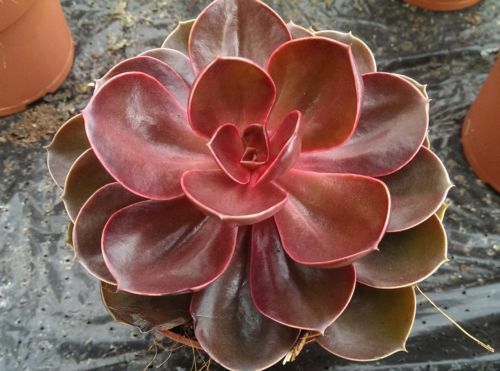 I'm a small reddish-brown succulent with leaves that whorl around my stem. I can grow up to 6 inches tall, and I'll eventually spread or drape over the edge of my pot. I grow very easily and need standard care: lots of sunlight, more water in the summer and less in the winter. Be sure not to over-water me. I have pretty, purple-tipped leaves and love lots of sunlight! I appreciate fertilizer a couple times during my growing season (the summer). Just be sure to pick one that is specifically formulated for cactus and succulents. In the summer, I'll grow long stalks that will bloom orange bell-shaped flowers. 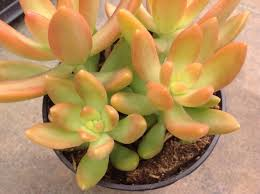 I'm a gorgeous hybrid succulent with narrow, textured leaves that range in color from green to gold, then become reddish in intense sunlight. With proper care, I'll grow beautiful stems with clusters of light pink flowers mid-summer! Like other crassula, I can withstand intense sun but am susceptible to over-watering. Water me once a month in wintertime, and every 10 days in summertime. Also called "Christmas Cheer," I get my name from the cute jelly bean-shaped leaves along my stems that range in color from a beautiful green to shades of red and pink. I can grow up to 6 inches tall and spread up to 36 inches wide, and I even grow small yellow flowers in the summertime! I thrive best in dry soil and areas with intense sunlight. Any fallen leaves will easily propagate, so just nestle them halfway into my soil. They'll eventually sprout roots and grow new plants! I get my name from the jelly bean-shaped, red-brown leaves along my stems. I can grow up up to 6 inches tall and spread up to 36 inches wide, and I even grow small flowers in the summertime. I will thrive best in dry soil and areas with intense sunlight. I get my name from my gorgeous, pink-gray leaves. I love full sun and well-draining soil, but can also tolerate partial sun. I cannot tolerate frost. My growing season is in the winter, and during this time I will grow stalks with red-orange flowers, and I'll require more regular watering. You'll be able to tell I need water because my leaves will appear a bit wilted and my soil will be completely dry. 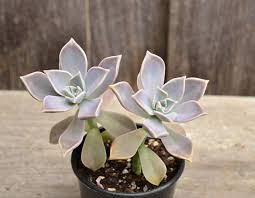 I'm a hybrid between Pachyphytum oviferum and Echeveria cante, and I crave dry soil and intense sunlight. 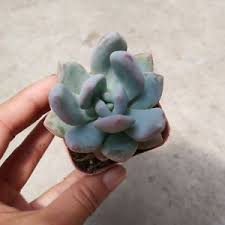 My leaves will turn a pastel shade of violet in strong sunlight. I'll grow beautiful, bell-shaped cascading flowers in the summer. I need plenty of natural light and water when my soil completely is dry. Please remove any dead leaves as I grow. I do best when repotted during a warm season. 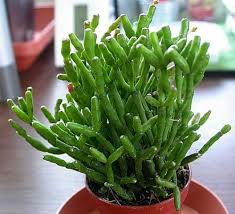 I'm a succulent shrub that can grow up to 3 feet tall. Be extra careful not to over-water me, and never let me sit in water or my roots will rot. 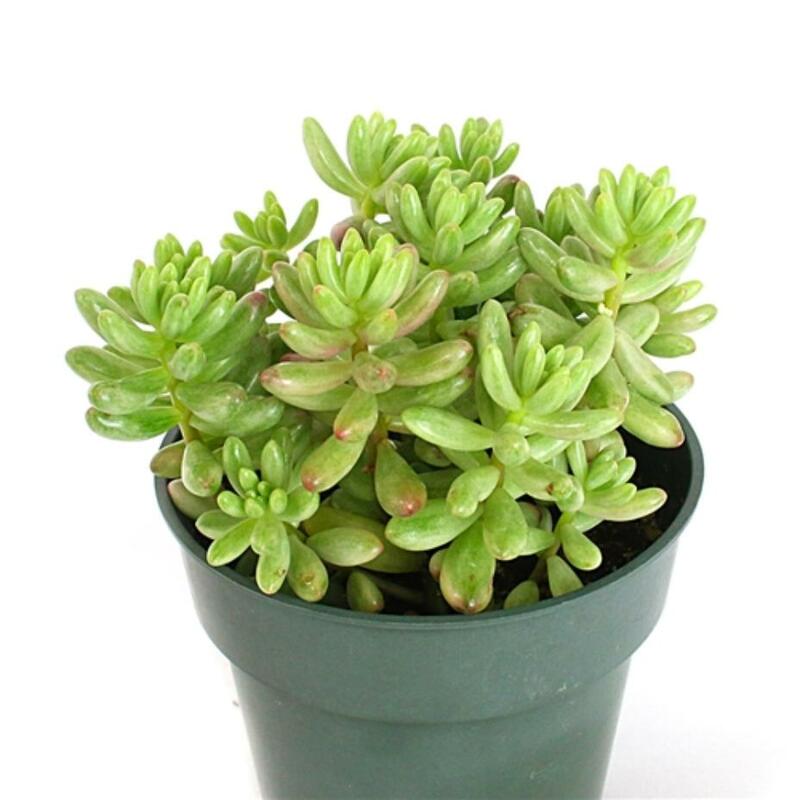 I'm a cute succulent with thick, pointed leaves, and I grow small white flowers in late spring and early summer. 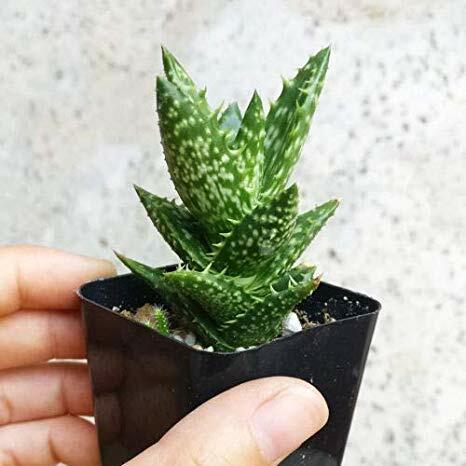 I'm slow-growing and stay pretty small - usually just a few inches tall - so I'm perfect for little containers or as part of a succulent arrangement. I don't need much water in the wintertime, and I like bright, indirect sun year-round, as I can sunburn in direct sunlight. Native to South Africa, I get my name from the flat bunches of leaves on my stems that look like little buttons. While I'm young, my stems will stand up straight, and as I grow they'll become pendant, making me a great addition to a hanging basket. I grow relatively quickly, crave well-draining soil and full sun, and I appreciate partial midday shade in hot summer climates. I got my name from the many sharp 'teeth' along my leaves. I'm a perennial that will bloom silky, bright yellow flowers in the fall. In extreme heat, I need some shade and water every few days. Otherwise, I will be just fine with occasional water and full-time sun. 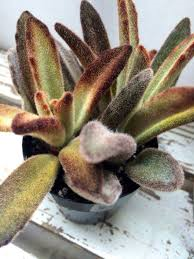 I have beautiful bright green leaves that are flecked with white and turn red-brown in full sun. 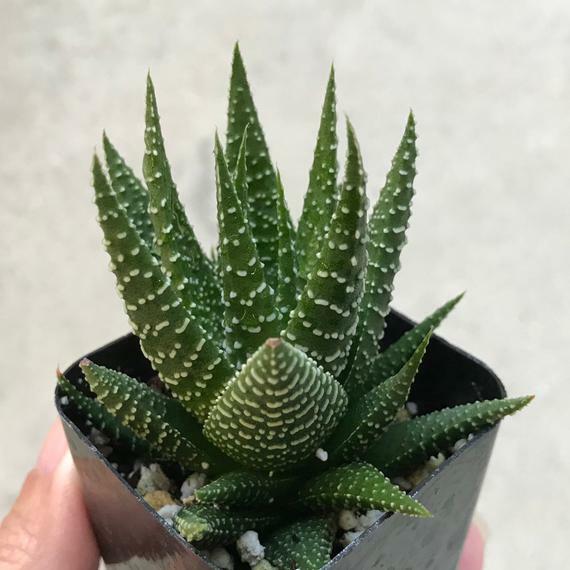 I rarely need repotting, but if I'm outgrowing my pot or I've stopped growing, it's best to repot me during the spring. Use a mixture of 2/3 cactus soil and 1/3 sand or pebbles. I should never be left to sit in stagnant water and love intense sunlight. Ease me from indirect sun into direct sun slowly, adding about 1 additional hour in direct sun a day until I can tolerate full, direct sunlight. I get my name from the little brown-red "claws" that will grow on the tips of my leaves as I mature. My growing season is in the summer, which is when I need more regular watering. Be sure to keep me in well-draining soil and plenty of sunlight. 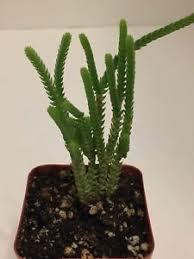 I'm a super unique succulent with tiny green leaves that are tightly stacked around my long stems, giving me the nickname "Watch Chain". As part of the Crassula family, I'm especially hardy and can withstand cooler temps. Plant me in well-draining soil, water me a couple times a month, and give me partial shade... I'll be happy! 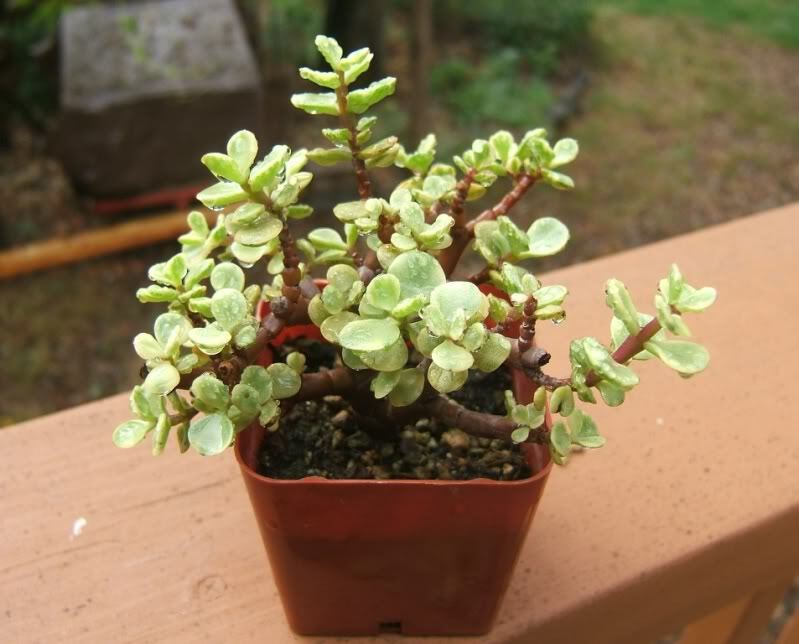 I am a cute, shrubby succulent that varies in color from red-brown to green. I get my name from the little white markings ("warts") along my leaves. Although my growth season is winter, I crave at least 6 hours of bright, indirect sunlight a day. During the hottest months of summer, I'll go dormant and pause growing. 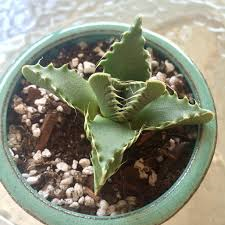 Perfect for a beginner plant parent, I don't need much care - just set me on a sunny windowsill or in a pot with other succulents and I'll thrive!